Many of the families we got to know in France had two working parents. So I was always amazed when we got dinner invitations and saw what these busy couples (OK, usually the mom) had managed to whip together. Part of the secret is that they had figured out how to streamline their cooking. This fish dish is an excellent example of how a tasty and elegant dish can be prepared quickly. Cooking en papillote means tightly wrapping something (usually fish) in parchment paper and baking it in the oven. The dish steams in its own juices, and the flavors are wonderfully concentrated. This dish is also fun to serve. Papillon is the French word for butterfly, which is a lovely metaphor for the visual effect of this dish. Bring the baking dish to the table, and watch everyone's faces as you unfold the wrapping to release the savory steam. Kids love helping to prepare this meal; wrapping the fish in its "cocoon" before it heads into the oven feels festive, like preparing a lovely present. Plan on serving one fish fillet per adult, two children, or four toddlers. Place a large sheet of waxed parchment paper intended for baking (aluminum foil works just as well) in a baking dish large enough to hold the fish in a single layer. Spread the oil over the bottom of the sheet and lay the fish on the sheet (skin side down, if appropriate). 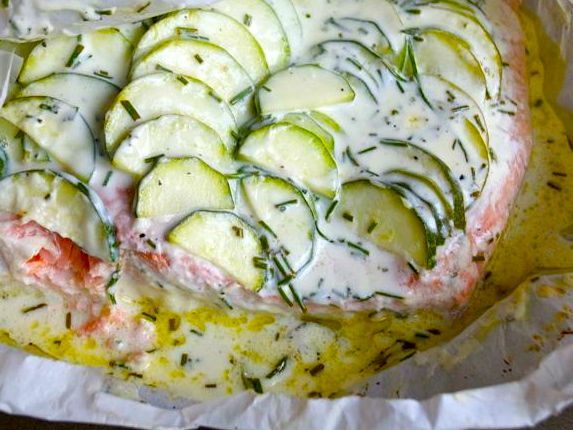 Layer the zucchini slices on top of the fish. Mix the lemon juice, yogurt or crème fraîche, chives, and salt and pepper to taste, and pour the mixture on top of the fish. Fold and close the paper tightly so that no steam can escape. (I usually make two or three folds with the two edges, then tuck the ends under.) Bake for 10 minutes per inch measured at the thickest part of the fish (no peeking!). You'll know it's done when it flakes easily when a fork is inserted gently.